Add thawed chicken wings to a 6 quart slow-cooker. Sprinkle with salt and pepper, cover, and cook on High for 1 hour and 30 minutes or until chicken is cooked through and tender, but not falling off the bone. Remove chicken to a rimmed baking sheet and set broiler to High. Place chicken under broiler and broil for 5 minutes or until the skin begins to crisp. Meanwhile, place whisky and honey in a small saucepot over medium heat and bring to a boil, stirring constantly. Cook for 3 minutes or until sauce begins to thicken. Remove chicken from broiler and brush liberally with the sauce. Return to the oven and broil for 3 minutes. Remove from broiler and brush again with sauce. Return to the oven and broil for an additional 3 minutes or until chicken is as browned and crisp as you'd like. Serve chicken with remaining sauce for dipping. Cinnamon Whisky. It appears to be taking the world by storm. I can totally understand the appeal. It’s dangerously delicious, with a little hit of sweet countered by just the right amount of cinnamon spice. Cinnamon whisky works well in mixed drinks, but it’s also surprisingly smooth and works great straight up. Of course, I’m not here today to tell you how to drink your whisky (or whiskey). I’m here to show you how to make the most epic football food you’ll ever serve at the big game. Cinnamon whisky and honey chicken wings! And because nobody wants to be manning a deep fryer when there’s a football game on, we’re going to start these babies out in the slow-cooker, meaning you’ll get undeniably tender and juicy chicken that gets liberally coated with a sweet and spicy glaze before crisping up in just a few minutes under the broiler. Dump some thawed wings in your slow cooker and season them with salt and pepper. Hello, easy. You just need 1½ hours on High for the chicken to cook through, making this a slow cooker recipe that’s actually ready pretty quickly. Pop your cooked chicken on a baking sheet and stick it under the broiler to get the fat from the skin rendering. We want crispy wings, right? While the chicken is crisping under the broiler, let’s make the sauce! You start with a bottle of your favorite cinnamon whisky and some honey. Boil it together and it’ll thicken up in just a couple of minutes. 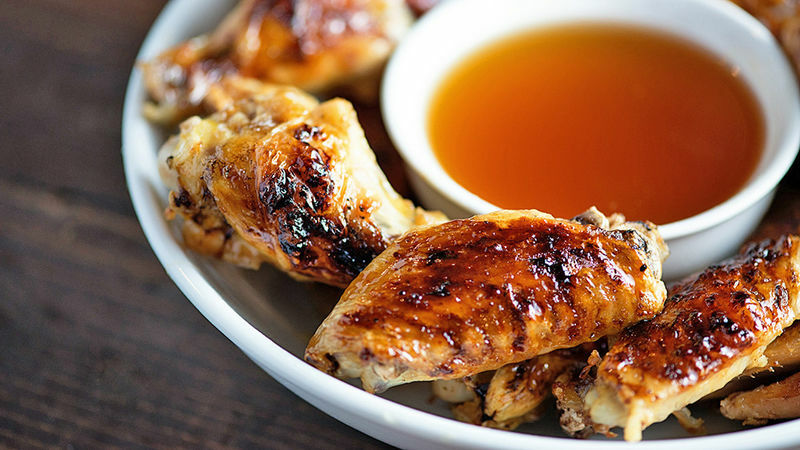 Brush that sauce over your chicken wings. Don’t be shy. Return everything to the oven to let the chicken get good and crispy while the sauce caramelizes just a bit. Prepare to be the hero of the big game. You’ll deserve the MVP!